It was a big project — the biggest I’d ever worked on. Everyone on the production team traveled to DC for four days and three nights. Our sheer number had us scattered around town at five different sleeping hotels. But every morning we taxied and shuttled to the venue hotel, where it all happens. Working a corporate event (which was why we, the production team, were there) is a tiring venture. You spend months preparing the show of your client’s dream (their corporate, not necessarily personal dream.) As a team you propose, create, write, build, assemble, print, proof-read, film, record and word process, all in the service of making it come alive. Then you go do just that — travel to the pre-chosen city for the birth of a bouncing, beautiful show!. So four days and three nights later, we’re ready to go home. Really ready. Annette and I are traveling together. We grab a cab, wave good-bye to that Grand Dame of Connecticut Ave, The Mayflower Renaissance (where, incidentally, the first night I flooded the entire bathroom floor as I tried to take a relaxing bath. 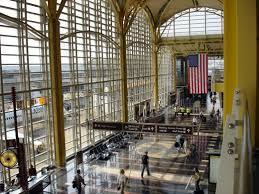 I did not find that relaxing) and taxied to Ronald Reagan National Airport. We reach Reagan. The taxi driver drops us at the American Airlines gate. We step up to do curbside and the sidewalk attendant starts to do the standard kiosk “check in” routine. We say, “No, no, we have our boarding passes, we want curbside check-in.” He looks confused. We point to our bags. He points at the door to the terminal. We look at each other and start walking. We get in side and see the luggage drop off conveyer just inside the door – yay! Finally we find our luggage drop-off. We step up to the attendant. She checks our paperwork, then silently points. Although this is our luggage area, we need to walk around, through a construction cordon, to the back of the structure to actually hand off our bags. The fuming had continued and the temperature of the terminal had risen to a humid 89 degrees inside my mohair sweater coat. We found the security line for American. When we reached the security guard, she pointed over her shoulder all the way down the huge arched hallway. “The red flag,” she piped then looked past us to the next person. Annette trundled off and I followed. I kept looking for this red flag. Far, far down, at the end of the airport tunnel I saw a huge Stars and Stripes. “Where’s the red flag?,” I asked Annette. “There,” she pointed in front of us. “I can’t see one,” I said, “I don’t have my glasses. I only see an American flag.” We stumbled to a halt. Just as we were trying to decide whether to continue or turn back, that same airport employee who’d helped us upstairs happened by. “We have a stupid question,” I whined as sweat dripped down my nose. Annette continued, “We’re looking for American Airlines security?” He gestured back from whence we came. “See that woman…” He pointed right at the lady who’d sent us packing. We both started to sputter, then acquiesced. The man stayed surprisingly polite, considering at that point we must have looked like the Golden Girls minus one on holiday without a map. So we trudged back to the same security attendant. I hadn’t noticed her marked island accent the first time, but this time it was clear as day. “You silly ladies are back? I told you — the red flag, all the way down!” She smiled a bit indulgently but shook her head at the same time, which put a definite crimp in the niceness. Back down the hallway we rolled. And walked. And sweated. Well, I sweated, Annette, wisely, was wearing a more breathable fabric. Finally, we see way at the end, by the big red (and white and blue flag) another American Airlines security line, handling passengers for our specific gate. And I mean finally. It was at the very, very end of the hallway, essentially taking us back in the direction where we’d originally entered the terminal. So, in essence, I guess the American Airlines door where we’d exited the taxi was technically close to where we had to enter to catch our American Airlines flight. If you looked at this in a very three-dimensional, as the crow flies, shortest distance between two points, way — had we been able to walk in the door and slide down a chute. Annette sailed through as a pre-TSA. I went through the hard way. Finally, we were in. We walked a ways and found our gate. There were even seats available. The first thing I did was take off that damn coat. Suddenly we both noticed the double set of down escalators twenty-five feet in front of us. I turned and looked at Annette. She was looking at me. “Are you kidding me?” I squealed? “Nope.” she said, but it was her face that really said it all. We started to chuckle. Then laughed right out loud. We toasted with our water bottles and waited. Soon, they called our flight. We jumped up and joined the line to the escalators. I was relieved to see it was the model where the four top steps cycle on the same level. I can almost get on those without needing a tranquilizer. And a drink. In a minute, we’re downstairs in line. A short wait, then they opened the doors and there it was, our bus. The line snaked out of the terminal and into the back door of the bus. It was a bus such as you take to the car rental place; some seats, some open spaces. The back door area filled up quickly, so I stepped around to the front, entered there and snagged the last seat. But the people kept on coming. We sat there for at least 15, if not 20, minutes, as passengers continued to load. Eventually we had to start playing subway chess, that game where everyone starts scooting over, backing up, turning sideways, shuffling to the left, shifting knees and bags, until everyone can shoehorn into the sardine can. One of the bus passengers, a flight attendant who was flying deadhead on our plane, started berating whomever was in charge, yelling loudly “You guys need to make this two buses. There is never enough room.” No one listened. Instead they shoved a few more people onto the bus. Finally, slowly, the bus started rolling. We traveled for about 1 minute and 45 seconds. Okay, maybe it was two minutes. The bus stopped and the doors opened. I was incredulous. I turned to my seatmate and said, “Seriously? We could have walked that backwards and single-file twice in the time we sat there!” Had she been drinking, she would have done a spit take. We were herded slowly up a covered, climbing walkway, the awning snapping in the wind. It felt a little like you were online for a ride at Six Flags Great Adventure. Finally, I came to a very scary piece of what looked like wooden shelving. It bridged the gap between the end of the walkway and the lip of the flight door. I crossed my fingers, stepped on, ducked and was finally inside the plane. It was one of those commuter specials, with two seat rows down one side and single seats running down the other. Mine was the last open single seat. In the back. By the time I reached it, there was no overhead room left, except where someone had placed their coat; their raincoat, their very light, easily hold-able raincoat. Luckily another deadheading flight attendant was nearby and jumped to my aid. “Is this your coat?” she inquired of the woman sitting directly in front of me.” She got an affirmative, but annoyed nod of the head. The flight attendant continued, chirpily, “If we can just carefully move your coat over here…” As the flight attendant gently transferred the coat to the adjoining bin, the woman reached out as if to stop her newborn from being tossed off a bridge — “then we can fit this right here.” The flight attendant patted the coat reassuringly. Then she helped me to slide my computer bag into the newly de-raincoated half of an overhead bin. She snapped both doors closed with a smile. I smiled in return. The passenger hissed at me with her eyes. It was finally time to sit down. I’m not small and airline seats are always tight. But this was ridiculous. I stuffed myself in, thinking “I’m going to have some damned interesting bruises when I get home.” Then a truly wonderful thing happened. Because I was already tired from being on-site for a show, which is always exhausting. And because I was tired from huffing, puffing and sweating through our Airport Iron Man Event, I dropped right off to sleep and didn’t wake until we landed. Ah, travel! What a joy, what a wonder. That was just two weeks ago. Tomorrow morning, Annette and take off again. This time it’s six days, five nights in Orlando. We’re booked into a family hotel. In Orlando. A family hotel. With four pools. In Orlando. Your honor, I rest my suitcase.